These signs are not intended to spoil your fun but to keep the animals safe and healthy. Feeding wild animals seems like a fun activity the whole family can enjoy. It’s a chance to get outside, appreciate nature, and give wildlife a helping hand. You may be wondering about when the best wildlife feeding times are. Or, maybe you’re trying to figure out, “What do raccoons eat?” But maybe you’ve also noticed some warning signs posted at your local parks, ponds, or other natural areas that say, “Don’t feed the animals.” What’s up with that? 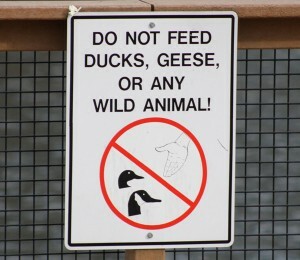 What could possibly be wrong with feeding wild animals? Actually, several things! But, don’t worry. There’s still a ton of things you can do for wild animals that will boost your opportunities for watching them. This article will help you sort out the good, the bad, and the ugly of feeding wildlife. You’ll be able to give them the helping hand you intend, rather than accidentally causing them harm. 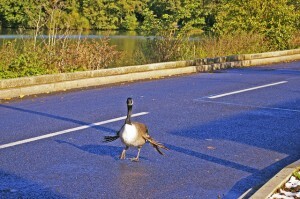 This Canada goose suffers from “angel wing” making him unable to fly, find food, and escape predators. 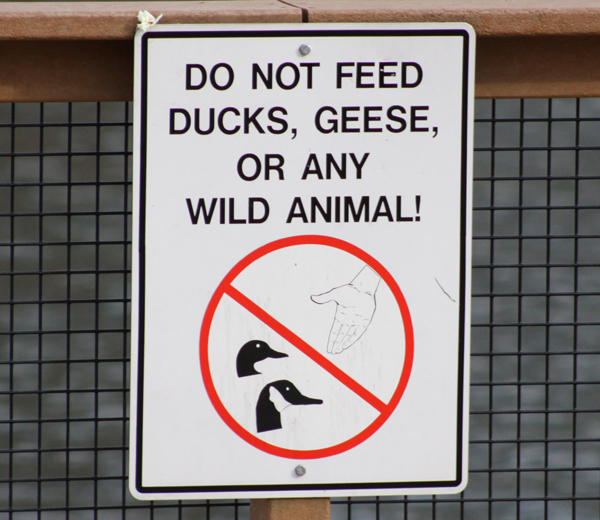 Let’s start with the ever-popular pastime of feeding ducks and geese. People have been passing along the ends of bread loaves, stale rolls and crackers, and other assorted foods for so long that it seems like mom and apple pie. Unfortunately, these foods lack the essential nutrition the birds need, most particularly while they’re developing. Their wings can develop in an outward twisting position (it’s called “angel wing“), robbing them of the ability to fly. This means they cannot escape predators, vehicles, or cold weather. Even the adult birds’ wellbeing will be compromised by the poor nutrition they get when they fill up on bread. It reduces their formation of muscles they need for migration, their reproducing capacity, and their ability to replace feathers. Your few slices of bread may not seem like much, but there’s no way to know how many others are also feeding them bread, leaving them too full to bother to search for the foods they need to be eating. What About Squirrels, Raccoons, and Other Wildlife? When deciding about feeding wild animals, you want to consider their overall wellbeing. They can find what they need to survive without our help, but naturally, they’ll gather in greater numbers where they can get an easy handout. What happens then? Some may lose their fear of humans and become aggressive, creating a nuisance or safety risk for you, your neighbors, or others—and repercussions for the animals, as well. If wild animals begin to crowd, they may injure one another while competing. Disease also spreads more readily when animals crowd together, which can, in turn, create a hazard for you and your pets. An unsecured trash container becomes a wildlife smorgasbord. 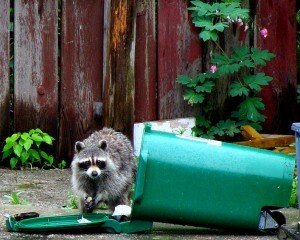 Trash cans that are not properly secured become wild animal smorgasbords. Sometimes we are feeding wild animals without even intending to do so. Wild animals can get into trouble when we inadvertently tempt them by not securing trash adequately. Others will see the mess that’s created and blame the animals, but it’s really people who can prevent these messes. Failing to rinse out food containers can lead to animals getting their heads stuck in them, causing suffering and starvation. And, what about those pet food dishes out on the deck? They’re a temptation, too. When wildlife wander in to share in the buffet, they may interact with your pets or pass a disease to your pets, or possibly to you. For this reason, you want to feed your pets inside or, if doing so outside, stay with them, and take the dishes up as soon as they walk away. Picnic areas and campgrounds are other areas to be mindful of what you leave behind. Though in those cases you’re not looking to feed wildlife, failing to do a thorough cleanup or leaving tasty-smelling things behind will teach wildlife to view picnics and campsites as great foraging areas. This places people at risk of future conflicts with wildlife at those sites, and wildlife may pay with their lives for the consequences. Even in your own backyard, remember that table scraps belong in the trash. If you sweep them from the picnic table to the ground or place them in an open compost pile, mice and rats will come. For wildlife you hope to attract to your backyard, the best approach is to naturalize some of the yard by adding native bushes, trees, flowers, and grasses. These will provide a variety of natural and healthy foods for wildlife in all seasons—nectar, foliage, seeds, cones, nuts, berries, twigs, buds, and so on. And, hey—with native plantings, you won’t have to wonder about wildlife feeding times—you’ll have a 24/7 buffet for feeding wild animals! Check with your local native plant society or university cooperative extension office for plants appropriate for your area. When fall comes, don’t strip the yard of dead stalks, leaves, seed heads, and twigs. Wildlife will use these for food and cover throughout the winter. Then, in spring, they’ll use some of these materials for nest building. 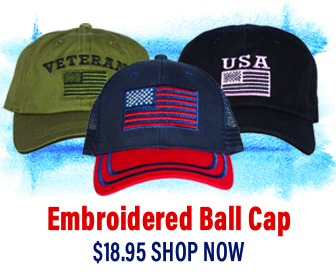 Think of your yard as the place they’ll need to “shop” for the various comforts of home. If you have a soft spot in your heart for birds, here are a few suggestions. Use feeders that are easily cleaned (plastic, glass, and steel, rather than wood or clay), and choose quality seed, rather than cheap mixes that end up getting picked through and sitting on the ground to mold. Top choices include black-oil sunflower seed, white proso millet, peanuts, and nyjer seed. In spring, help your nest builders by putting out some pet fur (that has not been treated chemically for fleas and ticks), cut pieces of yarn or string, and strips of cloth. Put out baked and crushed eggshells to boost their calcium for the nesting season. In summer, let most birds find natural foods and teach their young to do the same. But you can help hummingbirds by putting out a nectar feeder and help goldfinches by putting out nyjer seed while they’re waiting for thistles to go to seed. 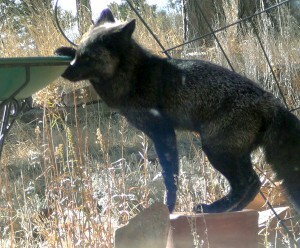 You will be amazed at the wildlife that may visit your bird bath. You can enjoy lots of wildlife viewing—especially birds—by maintaining a reliable water source in all seasons. This becomes especially important in winter, when having to search far and wide for water can use up precious time and energy for wildlife. Be sure to keep it clean and replenished, and sit back and enjoy watching the wildlife visitors you’re sure to have. Oh, and what do raccoons eat? Practically anything and everything they can get their adorable little hands on—and they’re darn good at finding the natural foods they should be eating, so best not to tempt them with other stuff! Hey Buddy!, I found this information for you: "Feeding Wildlife – Tips for Those Who Love Wildlife". Here is the website link: https://effectivewildlifesolutions.com/feeding-wildlife/. Thank you.